Julie Bozzi: American Food is an exhibition that consists of an oak cabinet with 13 drawers, 12 of which contain miniature reproductions of various food products, each carefully handmade by the artist. These food products have been categorized by 'genres' which are indexed in the thirteenth drawer. Boz z i began her research for American Food in 1976 and created the work between 1980 and 1992. 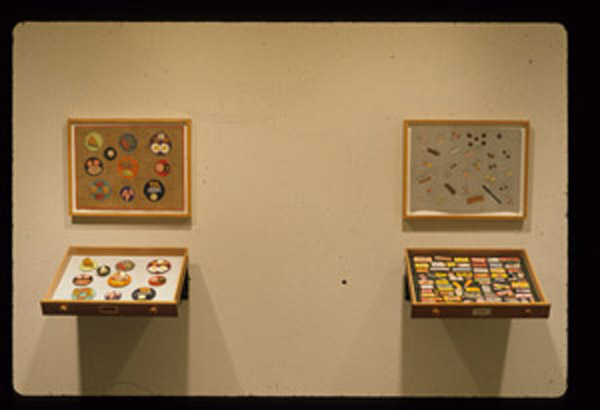 In determining her food types, the artist employed non-traditional research material, such as memory, observation, oral history and menus, in a process reminiscent of early ethnographic studies conducted by ship's artists who recorded the customs, clothing, and cuisine of cultures different from their own. The foods are recognizably American--donuts, packaged candy and snack cakes, cold, cereals--or represent an Americanized version of ethnic cuisine. Presented within the format of ' a natural history display case, the exhibition: addresses our love of foods, and our penchant for defining and categorizing our surrounding experiences. The exhibition also includes 10 framed drawings which reference, the drawers' contents. American Food was organized by the Musuem of Contemporary Art, San Diego which is overseeing the exhibition's national tour. Julie Bozzi was born in 1943. The lartist has participated in numerous group exhibitions, among them, Tradition and Innovation Museum of Fine Arts, Houston (1990); Land, ACA Contemporary, New York (1988); Natural Settings, Corcoran Gallery of Art, Washington, D.C. (1986); New Work: New York/Outside New York, The New Museum of Contemporary Art, New York (1984); and California: state of the Landscape, Newport Harbor Art Museum, Newport Beach (1981). Bozzi's work is included in the collection of the The Brooklyn Museum; the Lannan Foundation, Los Angeles; and the Modern Art Museum of Fort Worth, Texas among other institutions.